One of the most common ailments dogs face are worms. 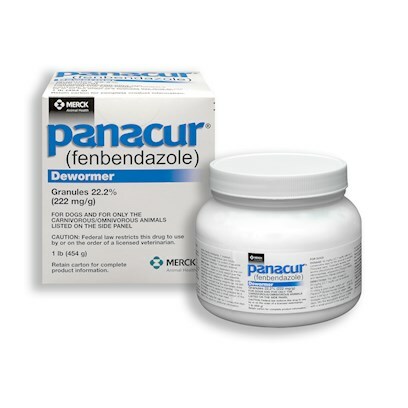 Panacur is used for the prevention and treatment of a broad spectrum of gastrointestinal parasites. It is also used to treat respiratory tract infections, parasites infecting the bronchial tree and lungs, and chronic diarrhea (if no other cause can be determined). The FDA has approved Panacur for large and small dogs only. Side effects are rare, though vomiting may occur. If your dog exhibits any symptoms of an allergic reaction, such as difficult breathing, swelling, or hives, contact your veterinarian. While there are no known food or drug interactions, you should always tell your veterinarian before starting a new medication if your pet is taking any other medications, including vitamins and supplements. Use as directed by veterinarian. Dosage varies due to the dog's exact body weight. Packets of granules should be mixed with the pet's food and administered for several consecutive days for best results. Depending on the dog's health condition and reaction, Panacur may or may not be used longer than three days. To avoid re-infection, it is important to keep the pet clean and free from fleas and other pests. Most adult dogs should be de-wormed at least twice a year.